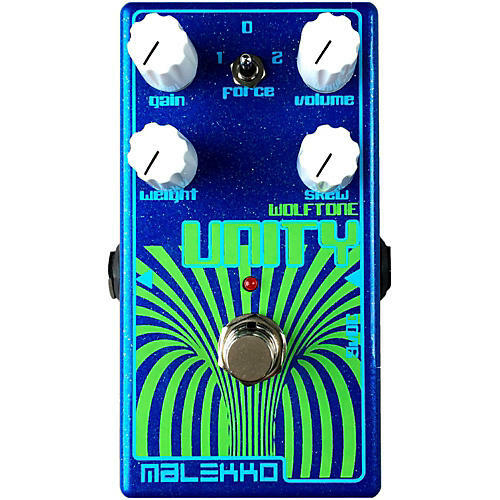 Designed by Todd Wolfgram, Malekko is thrilled to release the all-analog Wolftone Unity pedal. Featuring locally powdered and screen-printed enclosures, each pedal is built with meticulously selected components. Unity is a multi-tap two-transistor fuzz pedal combined with a compression section, allowing maximum fuzz-tone flexibility and feel. From over-the-top mayhem to buttery smoothness, the Unity, like all Wolftone pedals, is very responsive to a player's dynamics. The three controls, Weight, Gain and Skew each create a certain kind of gain and distortion. They tap into the circuit at different places, and as a result, each displays different characteristics in how they respond to the player and in what they do to the timbre and overall signal. Add the compression's Force Switch and you have an extremely flexible and reactive fuzz pedal, from sweet to sour, from terrifying to soothing.